Heartbeat's interface combines both familiar and innovative elements. MUSIKMESSE 2015: Said to be "the drum synth of your dreams," Softube's Heartbeat draws inspiration from classic '80s machines but is an original plugin based on the company's own modelled analogue synthesis techniques and some "carefully selected" waveforms. It has eight channels - two bass drum, two snare and percussion and cymbal channels - the parameters of which can be edited. Each channel has its own corresponding one in the mixer, and there's also an effects section. 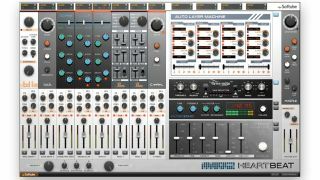 Less conventionally, there's the Auto Layer Machine - this has four channels, each of which can be used to layer sounds or let the output from any of the eight instruments trigger a chain of events. The theory is that you can create new sound textures or automatic fill patterns in up to four steps. You can also add randomness for each trigger using the Chaos sliders. Heartbeat will be released in the Spring, so potential buyers shouldn't have too long to wait for it. Find out more and check out sound examples on the Softube website.